As every photographer knows, the key to capturing beautiful images is light. Even more important, also as every photographer knows, is having your camera ready at all times. This is the second time I’ve noticed a really stunning display of light on porcelain insulators and rushed for my camera—only to discover dead batteries 😦 The first time was a couple of years ago, and I still managed to get a nice photo. The second time was yesterday (or maybe the day before?). We’ve been having very overcast skies with no rain. 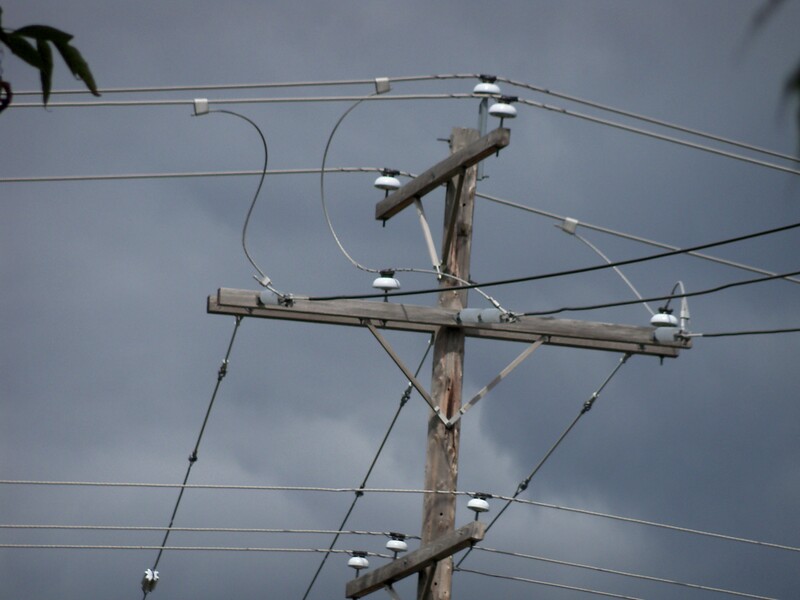 As I let the dogs out the back door, I glanced up and noticed that a flash of unexpected sunlight had brightened the porcelain insulators, which positively glowed. The effect was stunning, that gleaming white against a backdrop of dark clouds. I ran inside, got my camera . . . and then had to fool around with changing the batteries. By the time I got back outside, the light had faded quite a bit. So much for my fabulous photo opportunity. I snapped another couple of pictures, but it was largely a lost cause. On the other hand, I later found it very instructive to compare the first photo (above) with another I shot less than a minute later (below). While there was still a small amount of direct sunlight in that first photo, look at how flat and uninteresting that utility pole is once the light has vanished. Below are the same two photos, smaller this time so you can compare them more easily. I still appreciate the lines and all in the second picture, so I don’t hate it. In fact, you can actually see the dark wires better in the second. But don’t you agree that the first is the better photograph? 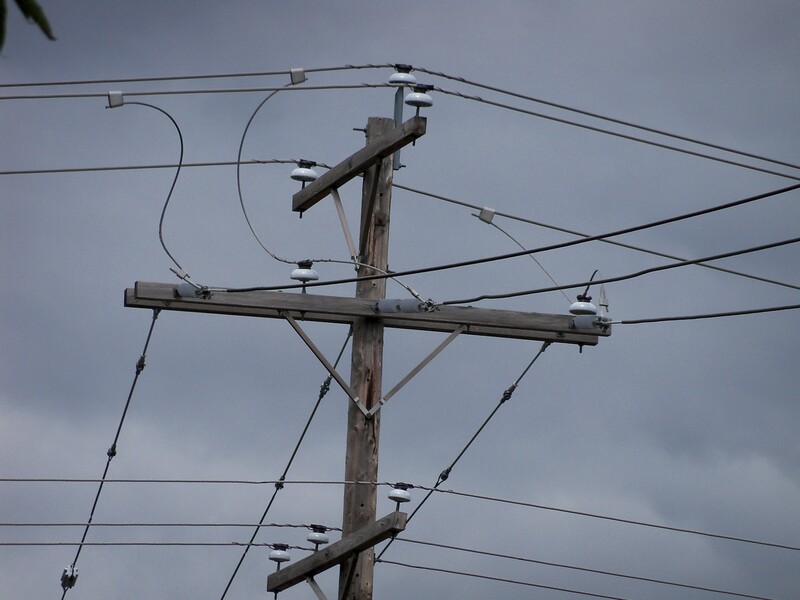 This entry was posted in Photography and tagged lighting in photography, porcelain insulators, power lines, utility pole. Bookmark the permalink. Very cool comparison. Both are good, but for different reasons. That is true with many things…and people. So very true. I hadn’t thought of it that way!